The initial street grid of the Old Granville Township, which followed the shoreline along Water Street, meets the (almost) east-west grid surveyed by the Canadian Pacific Railway on West Cordova to create an acute flatiron corner. This 1895 image shows the 1892 Holland Block designed by C W H Sansom for James M. Holland, an early real estate developer. The building borrowed from both Italianate styling and the bay widows of San Francisco, and in the early days the Queen’s Hotel occupied the upper floors. The building incorporated cast iron columns that show the BC Ironworks mark. There’s another flatiron building a bit further east. It’s actually two buildings, each designed by N S Hoffar and completed in 1888. The one we can see the complicated turret on is for J W Horne; beyond it is the Springer-Van Bramer block developed for the partnership of Ben Springer and James Van Bramer, both connected to the north shore Moody’s sawmill, and the developers of an earlier building on the south side of Cordova. J W Horne also developed a number of other buildings nearby, including one on Cambie Street also designed by Hoffar in 1890. Today the only additional building on this block is the Buscombe Building, built in 1899 as a 3-storey building for John Burns and later acquired by importers Buscombe & Co. The only significant building at this end of the north side of Water Street was the 3-storey warehouse for the Hudson’s Bay Company, built in 1894. It’s still standing today, but with two extra floors added in 1903. In the distance today the Woodward’s development adds a new flatiron building, a 43 storey tower designed by Henriquez Partners. When this picture was taken in 1899 the new courthouse was on the right, the lawyers had their offices in the Inns of Court Building at the corner of Hastings (on the left) and across the street was The Arcade, John Parr’s design for a two storey investment by Harvey Hadden (there were 18 stores on two levels, presumably taking advantage of the slope here). We saw the office building and The Arcade from a different angle in an 1896 image. The Flack Block hasn’t been built on the corner of Cambie yet, but the Commercial Hotel was completed in 1895, and is still there (although the cenotaph blocks the view from this position). The one mystery is the 3 storey turreted building north of the Commercial Hotel. Today it’s still standing as an SRO hotel known as the Melville Rooms, numbered as 322 Cambie; BC Assessment suggest it was built in 1900 (although clearly it’s older than that). In 1901 it was shown as offices, and was numbered as 334 Cambie. In 1899 property brokers and developers B B Johnston & Co had their offices here, with Mr Johnston and Mr Howe, as well as Atlas Insurance. We know that Johnston and Howe hired G W Grant to design a new office on Hastings in 1899 and another on Granville in 1900, but it looks as if this building pre-dates Grant’s arrival in Vancouver in 1897, and Johnston & Howe were based in another building on Cordova Street at that time. Garden, Hermon and Burwell had their offices here in 1897, (and a year or two earlier), a firm of civil engineers and land surveyors founded in 1866. J F Garden was Vancouver’s mayor from 1898 to 1900. It’s most likely this is an N S Hoffar designed building: J F Garden commissioned a building from him on Cambie Street in 1894. We can tell from other images that the turret was still on the building in 1937, but had been lost be 1946. W T Dalton designed it, and Beam and Halford built it, apparently to higher specifications than the tender required. It featured a gymnasium where Miss Hillyard, described as physical culture trainer at the high school, offered classes. The building décor was described as paneled with green, ‘the effect being most cool and picturesque. Each of the top storeys was furnished with bathrooms’. The building was opened in June by lieutenant-governor James Dunsmuir (the former premier) and the Daughters of the Empire assisted in entertaining the guests. Dalton and Eveleigh went on to design a $21,000 brick addition in 1909 built by Baynes and Horie. In 1906 he sidewalks were still planks that covered the ‘drainage’ along the street. As we noted in the previous post, the corner today has the plaza for Bentall 5, a large office tower that also has a Cactus Club restaurant alongside, designed by Musson Cattell Mackey. The YWCA residences was a substantial building that lasted a remarkably short time. Opened in 1969, it closed in 1995 and was imploded in 1997. Designed by Vladimir Plavsic & Associates it was added to an earlier 1950’s smaller building by Sharp, Thompson, Berwick & Pratt. It was replaced on an adjacent site on Hornby Street, and the original site became part of Bentall Five, a new office tower built in two phases – the top 11 floors were added several years after the first 22. To enable that to occur, a staging area had to be retained, and that’s where Musson Cattell Mackey’s Cactus Club Café was built once the office tower was complete. Here’s another gas station that you won’t find today. The Dunsmuir Service Station was opened in 1931 by Roach and Rosbotham at the corner of Hamilton Street. L A Roach and Thomas Rosbotham had another service station at 680 Beatty Street. In 1926 Thomas was the attendant at a Union Oil service station, and a couple of years earlier he was an orderly at the Shaughnessy Hospital. Photographer Jack Lindsay took two picture of the station in 1946 when it was managed by William Krikau. He had moved to Vancouver from Rosthern, Saskatchewan during the war, initially working for Dominion Bridge, then moving to Silverdale in mission in 1950 to run his own garage. Today the site is part of BC Hydro’s 1992 new office, with the supposed theme of water flowing down the mountains (the roof of the tower) to generate power. The Delmar Hotel, behind the service station, still stands behind the recently planted rainforest in the park, designed by W P White in 1911. Dalton and Eveleigh’s larger Alcazar Hotel, to the left of the gas station was built a year later, and is now part of the tower site. 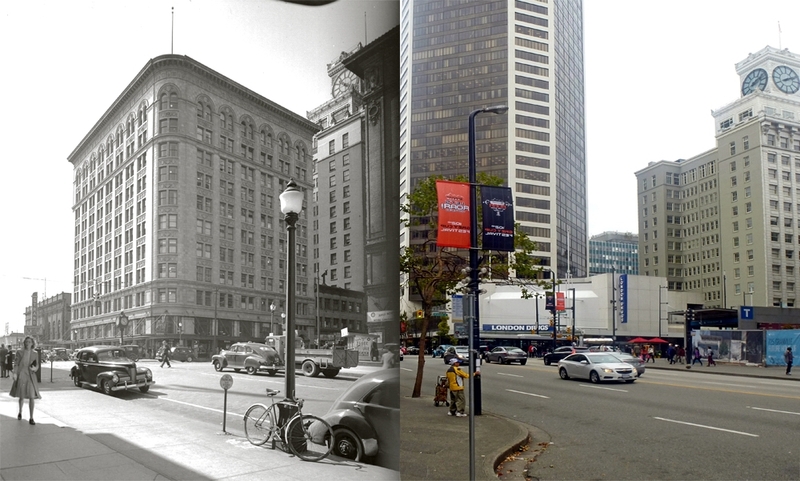 The Downtown of Vancouver was once a driver’s consumer choice. Today there are just two gas stations remaining – but there were once 99 (and maybe more). 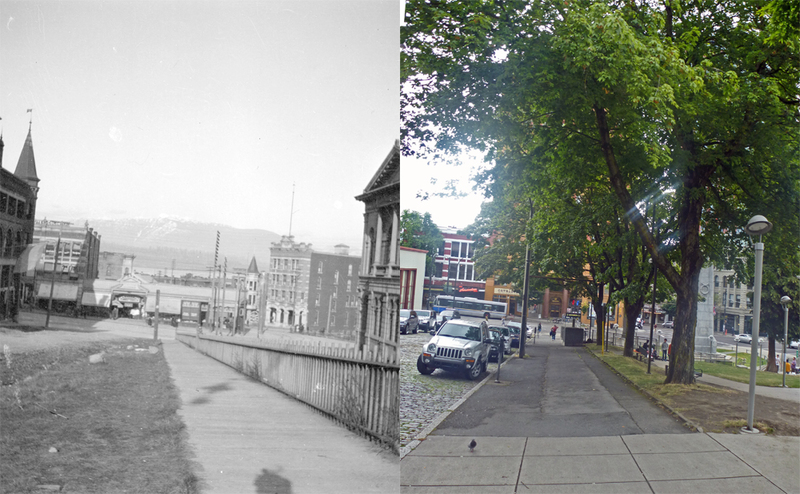 Here’s one of the earlier ones at 590 Hornby Street in 1920. It had been built that year on the corner with Dunsmuir Street, and was billed as a Gasoline Service Station – this was Imperial Oil’s Auto Filler #4, although they actually only had three, and this was the only one Downtown. We wondered initially if it was because City Archivist Major Matthews had worked for Imperial Oil that he was able to identify several of the people in the picture. “Men identified (left to right): Alfred Huggett, J.E. Hayden, unidentified man in car, Stan and Jack Duggan” – then we noticed that Mr. Hayden donated the image to the archives in 1960. In 1920 he was a clerk with the CPR who lived on Drake Street, Alfred Huggett was a clerk with Imperial Oil. There’s no sign of either a Stan or a Jack Duggan in the city then, although there was an A Duggan who drove a truck for a living. Major Matthews said that Imperial Oil, although a Canadian Company was controlled by Standard Oil, so even apparently rival filling stations were feeding the same profit stream. At the turn of the 20th Century all the garages received their supplies of gasoline from Imperial Oil, at 20c a gallon, and then resold it at 35c. Imperial decided to sell directly to the motorist at 20c marking the start of oil company owned filling stations – and significant animosity with the independent garages. After the war a wave of new premises opened – J W Horne opened one in 1916 only two blocks from this corner. Today there’s a bike lane and an anonymous 1968 office building on the corner.